Ancient Stones - Lothian - 047 Standing Stone, Eldbotle Wood, Dirleton. 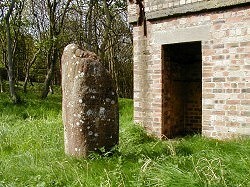 047 Standing Stone, Eldbotle Wood, Dirleton. This solitary standing stone is located west of Marina Villa in Eldbotle Wood to the north of Dirleton. It stands adjacent to an old WW2 observation building however access is difficult as the site is surrounded by a 2.00m high fence topped with razor-wire. The height of the stone is approx. 1.80m. From Yellow Craigs parking area, north of Dirleton, proceed to the shore and head west towards Edinburgh. Once past Marina Villa, follow the narrow footpath just above the high tide line. After a few minutes walk look for a faint trail heading left, into the woodland. Proceed uphill until a flat track is reached. The stone is in the fenced area to the east. Public car park at Yellow Craigs. 050 Piper's Stone, The Green, Dirleton.